Changes in consumer behaviour have also forced city authorities and transit operators to rethink how future transportation services might be delivered. Smart cities are booming. Earlier this year, the UN reported that 55 per cent of the world’s population now lives in urban areas – a proportion that is expected to increase to 68 per cent by 2050. The same report estimated that the number of smart cities around the world will grow so exponentially that, in the same year, an estimated 100 per cent of those living in urban areas will live in a smart city. Sensor-based Internet of Things (IoT) technology is underpinning much of this smart city revolution and, as smart city programmes continue to roll out across Europe, Asia and the United States, more and more governments will step up smart city investment in a bid to improve their own public services. In January of this year, for instance, the Indian government selected 99 cities to be upgraded as part of its independent ‘Smart Cities Mission’. As well as developments in IoT technology, changes in consumer behaviour have also forced city authorities and transit operators to rethink how future transportation services might be delivered. A trend towards the “sharing” or “gig” economy has proved that access now trumps ownership for most people, and the ability to satisfy a consumer’s immediate needs through the tap of an app will always win out in today’s digital economy. MaaS (Mobility-as-a-Service) is just one example of smart city innovation that will improve quality of life for those living and working in inner cities. As a vehicle sharing service, MaaS alleviates the need for people to own a car and, instead, charges individuals a standard rate for their journey. Using IoT technology and sensors, the public will be alerted to vehicles that are free to drive nearby and sent an access code straight to their smartphone. By facilitating a customer’s bespoke, end-to-end journey, MaaS encourages travellers to pursue other forms of transportation that isn’t a private car. The wider potential of MaaS, then, is its ability to reduce congestion in cities by reducing the reliance on private vehicles as a primary means of transportation. MaaS also limits the number of private cars on the road. For city authorities, this makes predicting traffic flows and reacting to traffic events much more straight-forward. This reduction in vehicles also vastly improves sustainability, promoting socially and environmentally friendly forms of transportation, as well as a higher standard of living, and even car sharing between those making similar journeys. As IoT sensors become installed in cars as standard, vehicles will even be able to better “communicate” with one another on roads in a bid to improved overall road safety. One example of this, Vehicle-to-Vehicle (V2V) communication, is that if a vehicle were to break suddenly on a busy road, the sensors would alert the cars behind it - even those ones that can’t see that particular car - and automatically break for them, thus eliminating any risk of human error in this currently invisible emergency situation. By merging GPS with big data and real-time analytics, real-time “living maps” can also be created to alert drivers to changes in weather that affect road closures, building work, accidents, traffic build-up, and even car park capacity. In big cities especially, a significant amount of road congestion can be attributed to searching for car parking spaces: all of which would be mitigated through IoT technology. These real-time maps will become increasingly prevalent amongst emergency services teams, who can use the maps to reroute ambulances, for instance, according to changes in hospital capacity, traffic load and other incidents, and thus cut down on incident response times. The rollout of electric and autonomous, cars, and the numerous benefits to the environment and road safety, has been heavily publicised in the last year. Just this month, the University of Glasgow announced that a new prototype battery had been created which could charge an electric car in seconds – meaning drivers can instantly refuel in the same way they always have. While it is only possible to charge vehicles at home or at work currently, Holland has already published plans to roll out an electrical infrastructure in 2020 so that the switch to electric vehicles can take place. Based on the EU’s recommendations, similar plans are expected to be pushed out across Europe in the coming years. As the use of electric cars becomes more commonplace, IoT technology will mean that those cars will become more connected than ever before and the possibilities for innovation in smart city transport will soar the world over. Making UK cities smarter has been high on the agenda for the public sector for some time and it has been over three years since it was first announced that the government would invest £40 million in IoT with the intention of making the UK an international leader in new and innovative technologies. In fact, in June of this year, Sadiq Khan reaffirmed the UK’s role as a leader in IoT once more by announcing his own bid to turn London into the smartest city in the world. Additionally, a £365,000 investment into the London Office of Data Analytics will be used later this year to promote greater data sharing among public sector bodies. First and foremost, however, Sadiq Khan’s plans are to support the implementation of internet of things (IoT) technology in the capital, create more charging stations for electric vehicles, and implement more and improved public Wi-Fi. 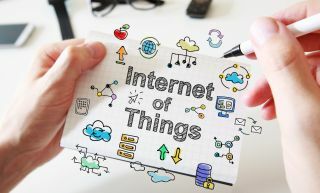 For organisations in the public, as well as private, sectors hoping to stay ahead of the IoT curve, responding quickly and readily to technological change will become crucial in the next year.